Facebook is The Worlds Most Popular Social Network and Now you can use your custom cover photo on your Facebook timeline. Today I'll show you How can you create an Awesome Windows 8 style Timeline Cover photo. 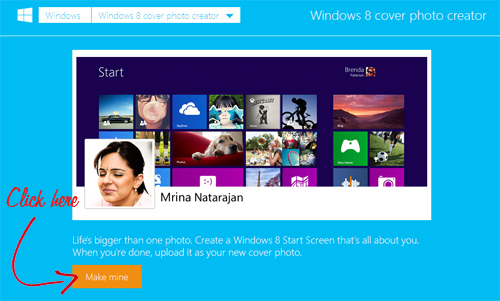 This kind of Cover can be created by using 'Windows 8 Cover Photo Creator'. 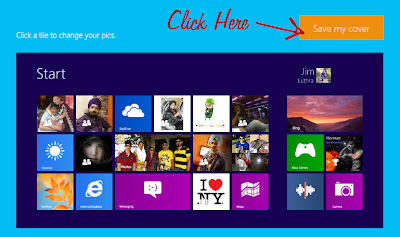 This app creates Windows 8 style Cover by using various photos from your Facebook album, Friend list, Likes etc. You can choose photos which you want to keep. You can also change Background color with your favorite one. Here are the steps to get this awesome cover photo. Make sure that you are logged in to your facebook account. Step 2: Now click on 'Make Mine' Button. Step 3: Facebook will tell you to 'Go to App', Just click on it. Wait till it loads your friends photos. Step 4: Customize the look of your cover. You can also change the Background color of your cover as required. wait till the app creates your cover. 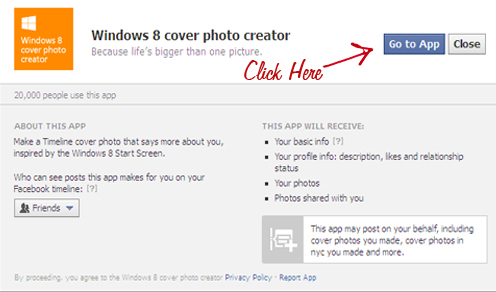 This will create and save the cover photo in your facebook photos. Now If you want you can manually set it as your cover photo.